Next to learning to read and write, Critical Thinking is probably the most important aspect of a child’s education and remains so for life. Being taught how to analyze the motives, thoughts and writings of others is essential now, more than ever. But how does the homeschooling parent, who may not be well-versed in this necessary skill, pass it along to his/her child? izzit.org is the answer. 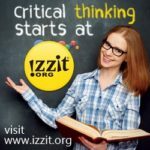 With your FREE membership, you are able to access the complete array of izzit.org’s teaching materials and resources. Their video presentations feature Teacher Guides, supplemental materials and even the transcript of the video narration for parents who want their children to read as well as hear the material. This is as broad and deep as teaching and learning can be! It seems that the developers of izzit.org have thought of everything homeschoolers notice. Besides their excellent video presentations, izzit.org finds and offers regularly-updated, interest-piquing online FREE print articles dealing with a wide variety of topics – current events, economics, the sciences, civics, business, finance and many, many other subjects, from a broad array of sources. In the Current Events section, articles might come from Slate, econolife, Bloomberg, Time and many more up-to-the-minute sources. izzit.org’s staff scours news from around the globe and assembles the daily roster of articles that can be read by the student (and parent). izzit.org’s colorful, interesting video presentations and lectures, bring your child significant information via your computer. Imagine learning about the legendary economist and influencer of the Founding Fathers, Adam Smith in “America and Mr. Smith” , or about banks “Too Big To Fail”, “3 Keys to Success”, “Morality in the Marketplace” and dozens more titles! These presentations are of the highest quality and keep the viewer’s attention riveted. I have not seen as efficient or effective a way to impart a vast array of knowledge and information to students of all ages than with izzit.org. As noted above, the complete teaching materials they offer to supplement the videos makes for a perfect vehicle for the homeschooling family. izzit.org chooses their subject matter intelligently and with obvious awareness of what children these days need to learn about in addition to traditional elementary academics. Homeschooling parents know that the basics are necessary, but we also consider knowledge of American History, finance, citizenship and Life’s pitfalls to be avoided to be of equal importance – and typically very hard to come by.